Current volatility in the global oil market is, according to most analysts, due to fears that markets are facing a severe threat. A doomsday scenario is being painted in the media which suggests that oil prices will collapse as Moscow and Riyadh allow for OPEC compliance to slip, and that a glut of Saudi crude will be hitting the market. This has been the leading theme in the last couple of days, after reporters stated that Moscow and Riyadh are ready to assist the market. At the same time, analysts and pundits support the thesis that Saudi Arabia is able to produce at least 12.5 million bpd, which will be hitting the market on short notice. 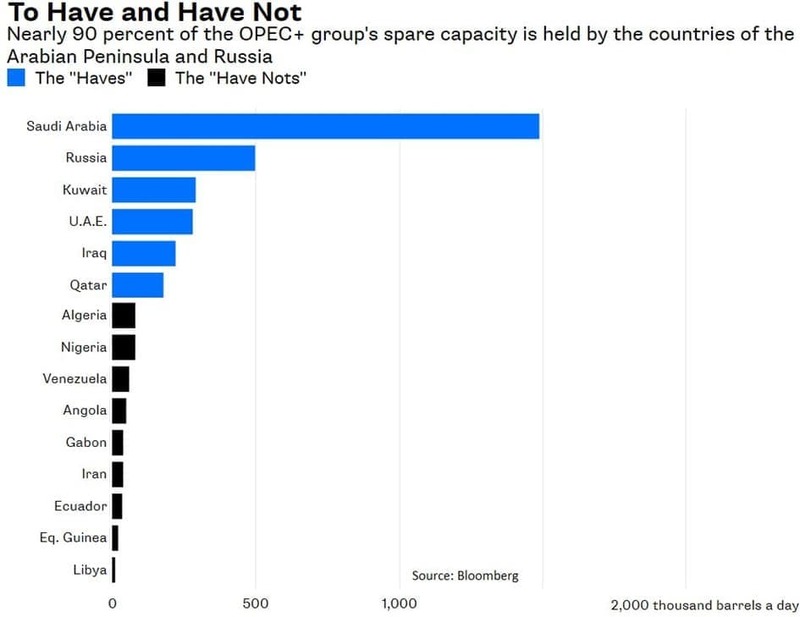 No one has really assessed the Saudi spare capacity capabilities though, with a majority of analysts taking the aggressive rhetoric for granted. Saudi Arabia, the Kingdom of Oil, will be the savior of the oil universe as it holds not only 276 billion barrels of reserves, but also can hit the market with millions of barrels of Saudi sweet to confront or mitigate possible shortages caused by Venezuela’s collapse, the lack of U.S. oil infrastructure, and the impact of Iran sanctions. The main question to be answered, hopefully before reality hits us, is if the Kingdom of Oil really is capable of opening the taps and keep them open in the long term. Several analysts have been warning about the possible technical issues Saudi Aramco is facing for years. The lack of inside information into the world’s largest NOC is one of the main reasons behind this. Some insiders have, however, been opening up some doors, indicating that Aramco could have hit a possible production ceiling, as production on several large fields, including Ghawar, has been hit by a long list of issues. In addition to the normal upstream problems, such as black powder, corrosion, biological fowling and misuse of seawater injection for decades, other issues could also affect overall capacity. Sources have seen major pipelines being blocked by corrosion and scaling, while other production has been hit by major sludging threats. These production issues are known, but the impact has never been able to be assessed fully. Financial analysts have always based their forecasts on open sources, such as reports from the IEA, EIA and OPEC, in which the statement is being repeated that Saudi Arabia has spare production capacity. In recent years, especially since the Russia+OPEC production cut agreement, it became a fact of life. 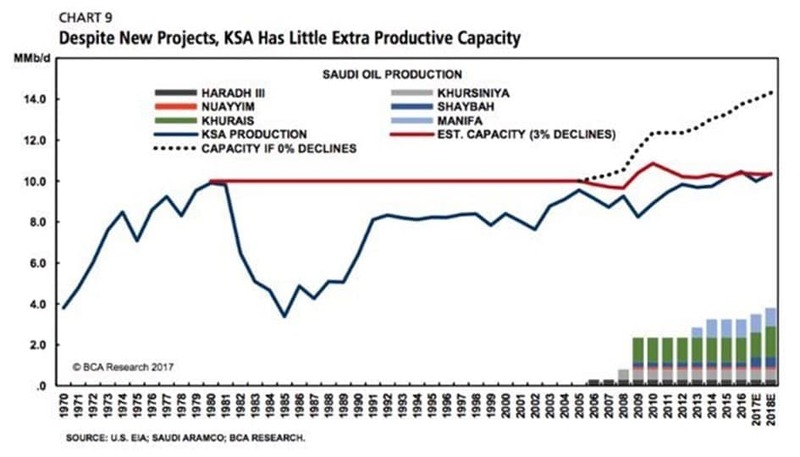 Existing production capacity of Aramco was seen as a law, and analysts even concluded that production cuts increased overall spare capacity by the same number. Few analysts dared to ask the main question: “If there is spare capacity available, can you prove the figures? At the same time, market watchers should have asked themselves the question: “When did Aramco ever produce even 11 million bpd in the last few years. Additionally, there are other indicators that Saudi Aramco could be fighting an increasingly difficult battle to keep overall production up in its existing fields. While analysts differ about the exact rates, production declines can be expected to be above 6 percent per year on average. If this is taken as a fact for all production in the Kingdom, additional new production needed to come onstream is around 600,000-750,000 bpd per year. Hence the ongoing impressive investment schemes, which were even in place during the last oil crisis, as continuous innovation is needed to keep existing production at the same level. This fact is also a major driver for the ongoing discussion within Aramco to speed up conventional field developments on- and offshore, such as in the Arab Gulf (shallow water) and the current focus on shallow-deep-water Red Sea area. The costs of drilling and developing these projects are much higher, than the very easy onshore oil that Saudi Arabia traditionally drilled. Still, the need is there to keep overall production figures at the same level, while even trying to get additional spare capacity. With the widely published spare capacity of 2-2.1 million bpd, the need for these projects would be much less than current investments show. When these questions are not being addressed, but become reality, OPEC’s upcoming meeting will be put in another light. Without a real spare production capacity, or with a much lower capacity, the current discussion is null and void. Additional oil on the market will be constrained, leaving a ceterus paribus situation, with increased threats from Venezuela and Iran. As U.S. bank Goldman Sachs already indicated, demand for crude oil and products is not showing any real slowdown. If production cuts stay in place, markets will tighten at an even faster pace. Despite the still elevated inventories and a small supply overhang, the Russia/OPEC mission has been mostly accomplished. A healthy appetite for crude, combined with an unexpected high level of compliance (or forced compliance in Venezuela’s or Libya’s case), has stabilized markets. Demand, as reported by all institutions and market watchers, is expected to be robust. The threat of higher oil prices culling demand is still very low, but will be looming on the horizon. For 2018-2019, no real risks exist for an oil price showdown. Without a real global financial crisis, lights are on green for a tight crude oil market for an extended period of time. OPEC’s Vienna meeting will not trigger a new oil glut. Some goodwill gestures might be expected, such as the use of Saudi’s floating storage, but in reality no options exist to move anything. Without major new investments outside of Saudi Arabia or the GCC region, the world is heading for higher prices long-term. 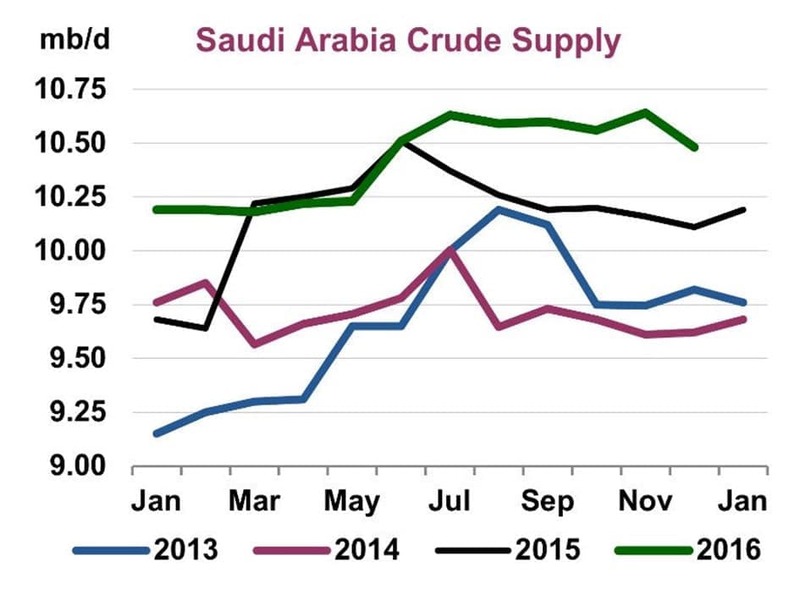 Counting on Saudi Arabia’s spare capacity could be foolish.